Banglalink Internet Offer 2018! Hello Dear, Welcome to Banglalink 1GB 25 TK Internet Offer 2018. All the Banglalink Special customers are eligible to enjoy BL 1GB 25 TK Special Internet Offer 2018. We see that, the last few month Banglalink Company provides some cheap rate internet offer like as Banglalink 2GB 45 TK; Banglalink 5GB 98 TK Offer and many more for their valuable customers. 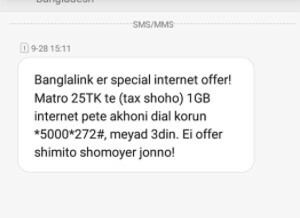 If you are a Banglalink customer and received an SMS same the below picture, you will eligible to enjoy Banglalink 1GB Internet 25 TK Offer. To know more about this BL Internet Offer 2018, just follow the below. To activate the Banglalink 1GB @ 25TK Offer, eligible customers need to dial USSD code *5000*272#. VAT + SD + SC is included in the amount. Customers can activate the Banglalink 1GB 25 Taka Internet Offer as many times as they wants during the offer period. The Validity of Banglalink 25 TK 1GB Internet Offer 3 Days and validity starts from offer activation day. Customers use the Banglalink 1GB Internet Offer both 2G/3G area networks and uses time 24 hours. This is a limited time offer. 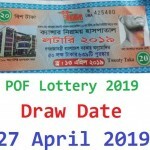 That means, any times Banglalink authority change or close this offer. Thanks for staying with us a long time and visiting Banglalink 1GB 25 TK Internet Offer 2018 content. If you have any question about the Banglalink 1GB@25TK Offer, just comment here. We reply as soon as possible.